I'm thinking about getting more range out of my bike to bike radio. The radio (with its integral aerial) is under the pillion seat but I was wondering if i could change to using the bikes radio aerial for my PMR radio. I know i need to change the cables and connectors to do this but would that work? TTSE 2017... Blue - the new Red!!! I would think there would be quite a mismatch in aerials for PMR and receive only broadcast radio. I would think it would not harm it as the power is so low BUT with a mismatch you would be getting a lot of reflected power back into the PMR. You really need a proper matched aerial to get any decent transmit. I am a Ham but not an RF designer though! Thanks John.. good point. I need to look into this a bit deeper.. Perhaps find a way to fit a more appropriate aerial in the radio aerial housing. I have not managed to unscrew mine but other have easily? But unscrew it and put an appropriate aerial on. I am sure it will still pick up some broadcast radio. Wet string sometimes works??? You would then have to put a correct connector on the end to fit radio probably an Sam? Check the radio. Actually if the radio aerial comes off it might just fit the mount. Putting a correct connector on the coax connector is probably the most difficult part. Not easy? If you were closer I could fit it for you (or actually get it fitted) I own a electronics design and manufacturing company. fascia panels ( See davybull's HOW TO: Topic on fitting the Triumph Sat Nav mount ). 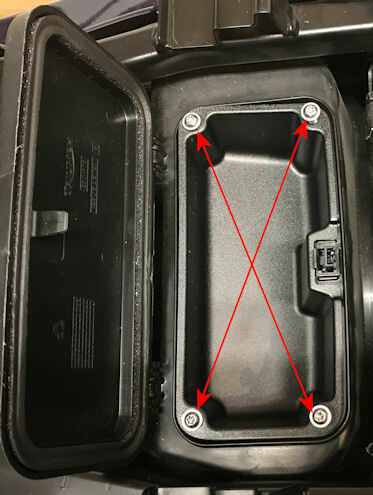 That connection may provide an opportunity for you to make your Bike to Bike connection. 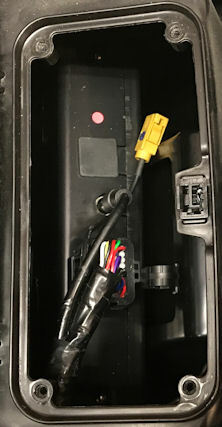 possibly by splicing into the connector using some sort of "Splitter" cable ? you'd need to get one with a connector for your specific Bike to Bike aerial ). if it also remains connected - it's a VERY expensive radio to replace if it goes "POP" ! and the stowage box lifts out to reveal the Audio Unit. located on the left side of the bike. ( "FAKRA" Type connector ? ) - which is not connected to anything. This is used on the US / Canadian export models for the additional XM Satellite Radio antenna. The other end of it is behind the left mirror pod clipped to the framework. 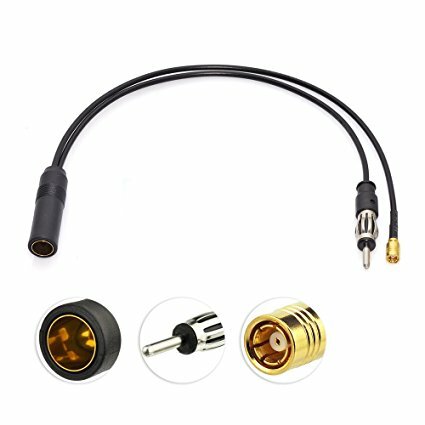 if you can find a suitable aerial mount ? yeah am familiar with the cockpit removal. I fitted my satnav mount. Great feedback. I dont really use the radio on the bike so i dont mind losing the aerial to that if it could work with the PMR radio or even to use the mount for the PMR aerial. I'll have a look at things... and let you know how things progress. IIRC, the only things that matter with RF antennas are length and placement. More length isn't better, it just depends on the frequency of the signals involved. If you do splice into the existing antenna, you should be able to fit an appropriately sized diode to the existing wire that goes back to the stock radio head to stop any feedback into the stock radio.